As I was watching Television, or should I say my DVR, I came across something I had not noticed before. During the commercials, that I normally fast forward through, I noticed something printed at the bottom of the screen. 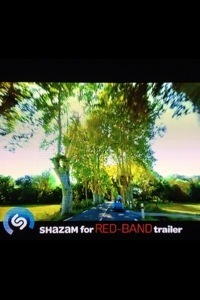 When I stopped to see exactly what it was, it was text that stated Shazam for Red Band. Being a movie lover myself, I knew what a red band trailer was and was surprised Shazam along with the movie preview that it was under had started a new interactive feature with movie trailers. First I will explain what a Red Band Trailer is and how they are utilized. When a movie is made, the company will also do a section for the movie trailer (preview) this is what you see when you are watching television and see a movie preview that makes you want to jump out of the recliner and go to the movies. The Shazam tie in is just a way to access this more explicit trailer. If you want an example, you tube search Evil Dead Red Band Trailer and you will see this is nothing any child should be watching. Shazam allows you to open the Shazam app and activate it while the normal trailer is playing on the television. It listens for the trailer and identifies the movie, it then launches on your device the red band trailer, and begins to play the more explicit preview. Most Red Band trailers are developed to push the envelope and are not appropriate for children. Be aware of this while you are watching television with your children and see the above pictured “Shazam for Red Band Trailer” ad at the bottom of your screen.